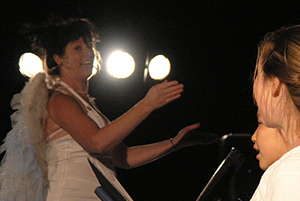 For over 20 years Polly Christie has opened people's hearts by teaching them to sing. Literally hundreds of people (at a time) have been led to ecstatic joy in community and festival choirs across Victoria, and around Australia, under her skilled leadership and masterful conducting. 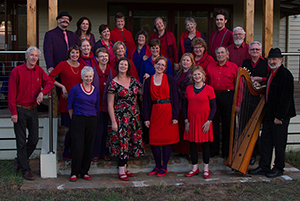 Polly established Pollyphonics Choir in 2008 in the Macedon Ranges, creating vibrant, soulful, choral performances ever since. They recently released their debut CD – available here. 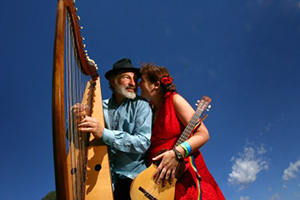 A beautiful singer and skilled songwriter, Polly makes music and performs with her partner, well-known harp player and musician, Andy Rigby, and in duet's and bands. See Polly's Gigs to catch her live. Polly is a local entrepreneur and community builder. She launched the Vocal Ranges Festival in Kyneton in April 2016. The success of the one day event has led to it becoming a three day event for May 2017. Having completed her Graduate Diploma in Education in 2015 Polly is developing a music program for teachers, and teaching singing at a local secondary school.